Most dogs can live outdoors, even during the winter months. However, some breeds do not tolerate the cold very well and should not live outdoors. These include Whippets, Italian Greyhounds, Chihuahuas, etc. These dogs cannot tolerate the cold for long periods of time and develop hypothermia very quickly. Large dogs living outdoors should have a cozy, insulated dog house. 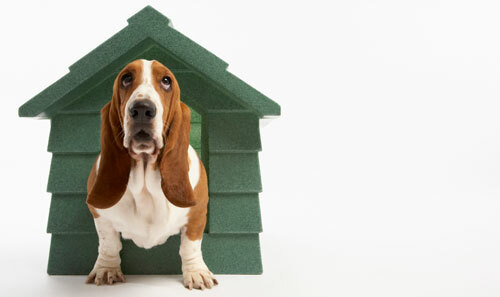 The house should not be too large, just large enough for your dog to stand up and turn around. A dog house that is too large will lose heat quickly. The house can be homemade; however, new insulated plastic models are available and reasonable in price. The dog house should be located in a sheltered, well-protected area. The house should have a southern or eastern exposure, in order to take advantage of the sun's warmth. The ground should be slightly elevated to prevent moisture accumulation and allow for water runoff. Placing the doghouse on an elevated platform will keep it off the frozen ground.